The topic of this article is about solution for Windows Server 2012 low disk space problem. This page will introduce the way to move free space from one partition to another. Download IM-Magic Partition Resizer Server to redistribute disk space on Windows Server 2012. It is easy and secure. Do you know that you can move free space from one partition to another without repartitioning the hard disk? If you still have any doubt, you can use IM-Magic Partition Resizer Server. This partition software can resize hard disk and move free space from one partition to another effectively and efficiently. By using this software, you don't need to repartition or reformat hard disk to redistribute disk space. This partition software is easy to use, so anybody who wants to resize partition Windows server 2012 can use it. You need to move the unallocated space close to the partition you want to extend. 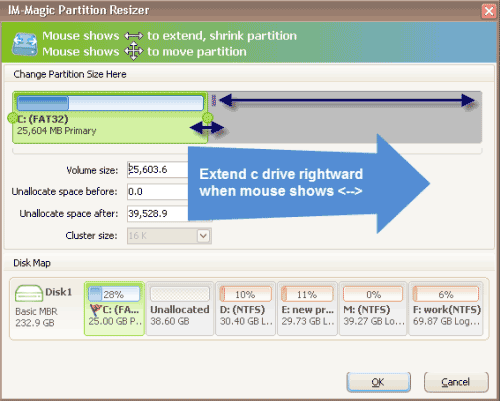 Then, right click the partition and choose "Resize/Move". Move the arrows to add the unallocated space to the partition you want to extend and click "Apply" button. "I received a low disk space warning message on C drive on Windows Server 2012 when I turned on my computer this morning. I found that there is insufficient free space on the C drive. System asks me to delete some unnecessary files to free up space, but I am not sure if I can delete them because those files have existed there when I bought the computer. 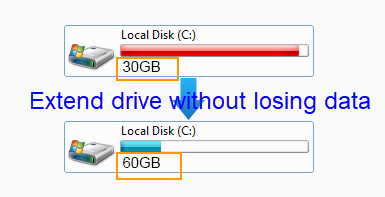 Can I move some free space from another partition to increase the size of C drive without deleting any data?" "Can I move some free space from E drive to C drive on Windows Server 2012? I installed a SATA hard disk on my computer several years ago, and I divided the hard disk into three partitions. Now, the C drive is nearly full and only E drive still has some free space. So I want to move some free space from E drive to C drive. How can I do it? Thanks for any help!" The professional partition software can help redistribute disk space when a partition is running on low disk space. The partition software allows you to extend C drive without reinstalling system or rebooting your computer, so it is time-saving and easy to handle. The software supports FAT32 and NTFS file system on all Windows Servers including Windows Server 2003, 2008, 2012, SBS 2003, 2008, Windows Server 2003 R2, 2008 R2 and Windows Server 2012 R2. It provides safe and reliable way to move free space from one partition to another without touching any data on the hard disk. This partition software also supports RAID 5 disk partition resizing. If you don't want to use partition software, Windows Server 2012 built-in tool Diskpart command is able to extend a partition. The Diskpart command allows you to extend partition when there is adjacent unallocated space beside the partition you want to extend. In another word, if there is no adjacent unallocated space, you will be unable to expand the partition. In addition, Diskpart is unable to extend system partition or FAT32 partition. If you want to run Diskpart command to extend a partition, you had better backup important data on the partition. You can also open Disk Management to resize disk partition when you run into low disk space problem. Under Disk Management, you can shrink a partition to squeeze some unallocated space and then extend a partition by moving the unallocated space to the partition that runs on low disk space. However, the problem is that you cannot move a partition under Disk Management but adjacent unallocated space is needed when you want to extend a partition. If you need to move free space from another partition to C drive, you may also need to reboot your computer which may takes lots of time. Therefore, professional partition software is often the best solution for partition resizing.